Linda Ruehle, City Clerk for the City of Issaquah retired on June 1, 2001, after serving the City and the community for 30 years. 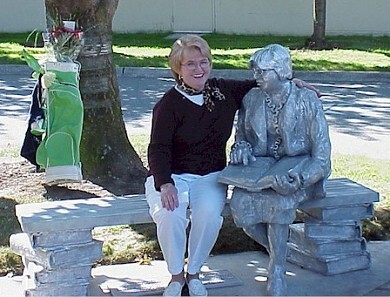 On October 5, 2001, Linda was honored by her City during a dedication ceremony of a life-sized bench sculpture installed outside the City Council Chambers at the corner of 1st Ave. SE and E. Sunset Way. The cast aluminum bench was sculpted by famous Pacific Northwest artist, Richard Beyer, who is most well known for his “Waiting For The Interurban” sculpture in the Fremont district of Seattle. The bench features a “representation” of Linda sitting on a bench supported by ordinance books, as she looks through one of the record books (see photo). The bench was paid for by the City of Issaquah Arts Commission and private donations. According to Linda, “I’m very overwhelmed and very proud. It’s a tremendous honor; and it’s very humbling to think the City would do this for me. I have always felt appreciated by my City, but this makes me feel even more appreciated for all those late night meetings and long hours of hard work.” City Administrator Leon Kos says the permanent honor is well deserved. “She was an extremely devoted and loyal employee. We really appreciated her thoroughness and knowledge,” Kos said. Linda says that Issaquah has always been in the forefront on many things, and that perhaps this sculpture of a City Clerk is also a “first” in the State (or even in the nation). “My greatest hope is that the sculpture will raise the awareness of the position of the City Clerk, in general, and the essential governmental services that the Office of the City Clerk provides,” said Ruehle. 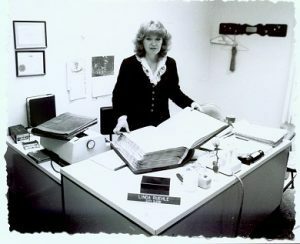 Linda Ruehle at her desk (circa 1976) posing with the City’s original ordinance book. The book starts out with the hand-written Ordinance 1, dated April 1892. (Photo courtesy of Linda Ruehle).